The signing of this MoU with the Association of Arab Universities marks a commitment to further work together on the design, promotion, delivery and evaluation of leadership programmes across the Arab region. 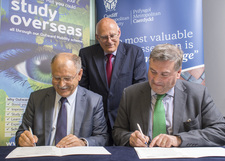 Cardiff Metropolitan University is proud to be the birth place of this special partnership, which is an outcome of Cardiff Met’s Internationalisation and capacity building initiatives in the Middle East and North Africa (MENA) region during the last 4 years. Cardiff Met is leading two Tempus projects, in partnership with the Leadership Foundation, the Association of Arab Universities and the ministries of higher education in Lebanon, Egypt, Libya, Tunisia and Morocco, to develop a framework for building capacity for leadership in higher education. Cardiff Met is building a stellar reputation for launching ground-breaking initiatives with the success of the Tempus Leadership in Higher Education Management project, and the Erasmus Mundus Programme, which facilitates student and staff exchange between Europe and beyond.